Orchards Homes: Opportunity knocks! This Deerfield floor plan is rarely available and is perfect for the growing family. You'll love the large lanai for entertaining and the beautiful sunsets! With the preferred rear southern exposure, you'll have plenty of sun all day long. Not too mention, there is plenty of room for a pool! The roof is less than one years old and all new gutters were installed insuring proper water management around the home. This home is move in condition and is clean as a whistle! All this located within close proximity to the beaches, shopping, arts and restaurants. If you have children that will be attending school, you'll be happy to know this home is located in an "A" rated school district! The Orchards has two community pools, two tennis courts, playground for kids, bocci court, weight room and community center for private gatherings. Don't miss this one....Make your appointment today! Orchards Homes: You will be amazed at how much space exists in this open floor plan 4bed+Den/2 ½ bath home in the Orchards. Cathedral ceilings throughout most of the house add to the expansive feel. As you walk thru the front door you are drawn to the indoor/outdoor feeling created by the 3 sets of sliding doors that open up the back of the house to the Huge outdoor living area with plenty of seating space and a brand new Picture Window Pool Cage! This outdoor space is made complete with a luxurious heated pool and waterfall. Back inside you will find a kitchen complete with granite, stainless steel appliances, and trash compactor. The AC was replaced in 2017 complete with ALL NEW DUCT WORK! The neighborhood offers 2 community pools, basketball, bocce, tennis & a playground for children. This community could not be more centrally located, and resides in an A-rated school system (Pelican Marsh Elementary, Pine Ridge Middle & Barron Collier High). 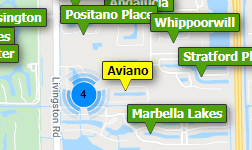 The Orchards is close to Vanderbilt Beach, The Ritz Carlton, Mercato shops & restaurants. Orchards Homes: This elegant home with its newly installed roof has a tremendous amount of curb appeal and is located in the gated community of the Orchards. Just a few minutes to the beach, the Mercato, restaurants and grocery shopping. Plus it is located in “A” rated Collier County School Systems: Pelican Marsh Elementary, Pine Ridge Middle School & Barron Collier High School. This home has been meticulously maintained with all the bells & whistles you can imagine. Upscale remodeled kitchen, bamboo flooring, tile on the lanai, luxurious lighting fixtures & fans and a lake view that will amaze. This home has rear southern exposure and sits on one of the nicest lots in the development. Sit on your sunny lanai (w/ room for a pool) and enjoy all that nature has to offer; flora & fauna abound. Peaceful, inviting and serene come to mind. And to top it all off, the maintenance fees are low; only $400 per quarter which allows access to the community's rich amenities like a community pool/spa, tennis courts and more. This is a true treasure that is unmatched anywhere else in terms of location, lot size, lake view, exposure & sophistication. This home will not last! Opportunity is knocking! Call today! Orchards Homes: With full price offer seller will install new granite counters on kitchen, new cabinet hardware and new granite vanities on all 3 bathrooms: from a pre-approved list of slabs and materials. See sample pictures. Owner wants this home sold ASAP - all offers will be reviewed within hours. A rated school zone, minutes to beaches, dining, shopping, and entertainment. Freshly painted exterior, front door, and lanai with room for pool. Open living room, separate family room and dinning area with split bedrooms floor-plan. Plantation shutters, pool bath, large laundry, lots of storage spaces. L shaped lanai with extra storage. A/C was replaced in 2015 with iComfort by Lennox thermostat system that allows you to control A/C from your phone when you are away. The Orchards community is located on Vanderbilt Beach Road with low dues, security gate, community pools, fitness center, playground, basketball courts, tennis courts, and clubhouse. Rarely available Southern exposure on the lake. Landscape planting was redone in 2017. AS IS WITH RIGHT TO INSPECT. MAKE IT YOURS TODAY. Call homeowner directly with all questions. See confidential remarks. Orchards Homes: Spectacular west-facing sunsets from your own lanai! This Stunning 3BR/2BA home (3rd BR is used as an office) offers an open floor plan that will captivate you. Tile throughout w/cathedral ceilings in kitchen, dining & living areas, all flowing beautifully together for great entertaining. Your chef’s kitchen offers ivory custom cabinets w/soft close drawers, granite counters, glass tile back splash, stainless appliances + island area. Impact resistant triple sliders offer access to your covered/paver lanai w/a heated infinity edge pool w/water feature & spa. Comes complete w/electric hurricane shutters. Fall in love with the luxurious master suite w/soaring ceilings, three closets, en suite luxury tiled bath w/a large glass shower enclosure & Grecian tub. The Orchards neighborhood offers tons of amenities like 2 community pools, basketball, bocce, tennis & playground for children. Located in the heart of North Naples and situated on a quiet Cul de sac, this home is within minutes of A+ schools, beautiful Gulf beaches & world-class shopping & fine dining in Mercato, Galleria Shoppes & Waterside Shops. Low condo fees will keep your expenses low! Orchards Homes: Fantastic opportunity to live in a wonderful North Naples gated community in this 3 bedroom, 2 bath with 2 car garage home. The Orchards has long been known for its great location, A+ schools and family friendly residents. The home is immaculate and has been updated with features of what buyers want today such as wood look tile in the great room, open light and airy great room/ kitchen with large open bar/seating area, stainless steel appliances, 42 inch cabinets, LED lights in kitchen, updated bathrooms, granite in bathrooms and kitchen, both electric and manual hurricane shutters, front screened door, large screened and tiled lanai, water purification system, new A/C in 2017, upgraded fixtures and window treatments and most important a new roof. The location of this home is superior sitting at the end of a cul-de-sac. The Orchards community offers two pools with spa, tennis courts, bocce court, exercise room, play area and is minutes from I-75, hospitals, parks, library, dining, shopping, entertainment and of course our white sandy beaches! Need professional assistance selling your property at Orchards Naples? Find out how an Area Specialist can help to generate more property exposure in order to get the most money for your investment in the least amount of time.